Barnyard Boogie Slots is a 5 reel 9 line video slot machine with a top award of 4,000 coins. Coin value starts at 1.00 and tops out at 20.00 and the higher jackpots will treat the player with sweet rewards. The game includes icons for a scatter and a wild, and the Bonus game. The ginger-bearded farmer is the symbol that will drop you the top award if you spin him five times consecutively onto an active pay line. The pig wearing the sunglasses is the wild symbol. He only appears on the second and fourth reels. He is able to substitute himself with other icons to help produce winning combinations on a spin. If you manage to spin him onto reels 2 and 4 at the same time, then you will be transported to the Barnyard Boogie slot feature. The scatter icon of the barn can win you multiples of your total bet simply by releasing more than one across the reels. Spin 2, 3, 4 or 5 and multiply your full stake by 2, 5, 20 or 200 times. 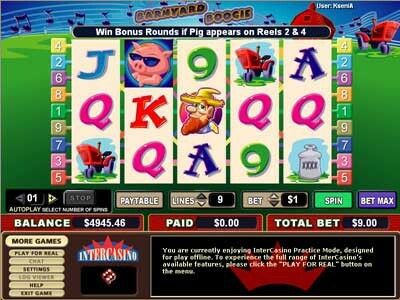 The Barnyard Boogie bonus game is triggered when you spin the pig onto reels 2 and 4 at the same time. You will then be transported to the barn to look for where all the Barnyard Boogie pigs have disappeared to! With six hiding places, you are given a choice of three, to discover where each little piggy Elvis-impersonator is hiding. If you find them, you’ll be earning some wonderful cash prizes.